Are you redesigning an office? Then you need to select the right seating for the office. Ideally your office should feature ergonomic office chairs. Ergonomic chairs will help users position their postures in a healthy and comfortable fashion. Remember, most office work tasks require employees to put stress on their spines for extended periods of time. When the spine faces extreme stress, back problems, neck problems and other physical issues come about. With ergonomic chairs and other ergonomic furniture, you can provide employees the lower back support they need to productively work. What are the best ergonomic office chairs? The answer will be based on the specific needs of your company. There are alternative furniture items available for workers that prefer other ergonomic solutions for back pains and other work-related physical pains. Adjustable seat height. You can guarantee this for your office workers by purchasing office chairs that include pneumatic adjustment levers. Quality adjustable seats should allow users to adjust seat height from 16 to 21 inches on average. The safest office seats will allow workers to comfortable seat for extended periods of time with their feet flat to the floor. The arms and thighs of office workers should be positioned comfortably underneath the desk and they should have plenty of leg room. As for the seat width and depth, the average worker should have backrest behind his/her back. Ergonomic office chairs provide the safest and most comfortable seating width and depth. When you are uncertain whether a seat is at the right height for a user, just think 90 degree angle for the knees and parallel hips. Plentiful lumbar support. Lumbar support is a feature included in ergonomic office chairs that offers good lower back support. This support protects the lumbar spine of a worker by promoting good posture rather than slouching. When workers can maintain good posture during long periods of sitting, they experience less lower back pains. All lumbar support systems included in ergonomic chairs are adjustable and a locking mechanism is present to secure the position of the spine along the back rest. Use fabric chairs. This perfect for office environments where good air flow is necessary to maintain work comfort. With ergonomic furniture, your workers will enjoy a healthier work environment. There will be less filing work injuries such as neck pains, back pains, and wrist injuries. All office chairs should have armrests, especially office chairs used for computer work duties. 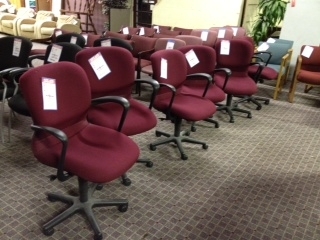 We also recommend the purchase of ergonomic chairs with headrests that allow comfortable reclining. You can count on Mark Downs Office furniture for effective, stylish ergonomic furniture. We have available both new and old ergonomic furniture that improves work flexibility and motion. Categories: Ergonomic Chairs | Tags: ergonomic chairs, Ergonomic furniture, Ergonomic office chairs, lumbar support, and Why is ergonomic seating the right office seating? This entry was posted on Monday, November 4th, 2013 at 1:21 am. Both comments and pings are currently closed.